Why is a Child Safety Pool Fence a "Must Have"? According to recent government statistics nationwide, "There were, on average, 5,100 pool or spa-related emergency department treated submersion injuries each year for 2008 through 2010." The study's key findings reveal that young children between one and three years old made up 64% of these estimated injuries. Among major risk factors a lack of barriers and supervision are cited. Therefore the CDC recommends that "barriers, such as pool fencing, can help prevent children from gaining access to the pool area without caregivers' awareness." LifeFence.com offers fully assembled Sentry's EZ-Guard Pool Fence to help protect toddlers, children and pets. Why take a chance with loved ones safety? With properly installed pool fencing, you can take control of a potential hazard on your property and guard your family from drowning risks. NOTICE:Our pool fence has been designed for personal home use only. Not suitable for commercial applications. Why Choose Sentry Safety EZ-Guard Pool Fence? LifeFence.com has taken the challenge out of purchasing and installing do-it-yourself pool fencing by offering the Sentry Safety Pool Fence EZ-Guard product line. Just measure your desired fence area, make your color selection and then order your pool fence by the foot. You'll receive a kit with all necessary materials to set up your pool fence. The fence and poles come preassembled, after drilling just stand the fence up, hook them together, and your done. EZ-Guard pool fence is a removable mesh pool fence designed specifically to provide a barrier around residential swimming pools for toddlers, young children and even pets! We also offer helpful tools to streamline the installation process. In your EZ-Guard Pool Fence kit you'll find a layout template, simply mark the holes where the template shows and drill. 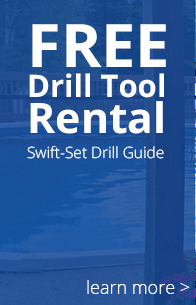 We also rent our exclusive drill, bit and drill guide package so your drillings will be on target every time. For a limited time each purchase over $500 automatically includes the FREE use of our exclusive drill, drill bit and drill guide package for one weekend. The alignment package is unlike anything available at the hardware store or from with other pool fence companies. Often the pool fence installation can be done in one day but the product will last for years. The EZ-Guard pool fence features smaller stainless steel rods and ground sleeves, adding remarkable stability to your pool fence and allowing for exceptionally easy installation and modification. Plus, we've provided an online installation video free of charge. Your pool can still play an important role in entertaining friends and family even with an installed pool fence. The EZ-Guard Pool Fence which takes just a few minutes to put up takes even less time to take down. The fencing unhooks from the wall (or other fence pieces) to release the tension which enables adults to lift the poles out of the sleeves. It is such a simple process that no tools are needed. Much like safety caps on medicine bottles, the quick removal is child proof but parent friendly. EZ-Guard's plastic ground sleeves protect the pool fence poles from the wear and tear of repeated setups and take downs. Plus, they protect the feet of your family from the sharp edges of the holes while your pool fence is in the down position. Installing your own child safety pool fence saves time and money. Don't rely on fitting into the busy schedule of a contractor or installation company. Do it yourself in your own time frame. Also with the template and alignment tool to guide you, it is simpler than ever to do the job right. With a little work on your end, you can save the cost of hiring someone to do it for you. LifeFence.com believes protecting your children shouldn't have to break the bank. We bring you an affordable solution to pool safety, the do-it-yourself EZ-Guard Pool Fence. 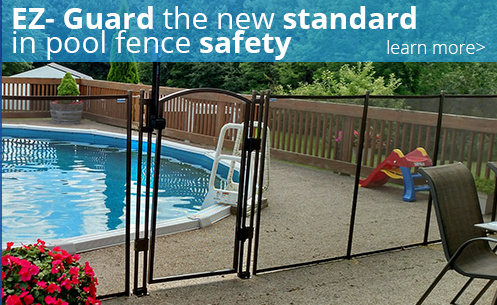 Our child safety fence is one of the safest, easiest to install and most durable safety pool fences on the market. In the blink of an eye your child can leave your site, but with the EZ-Guard your pool will be one place you will know your child can't go.